Vernier is a technological device that increases the sensitivity of the measurement instrument, when it subdivides the smaller division of it. On this simulator, the vernier (rectangle below the scale) has twenty and five spaces between the vertical lines. This means that it divides by 25 the dimension 0.025in (twenty and five micro inch) that is the smaller division of the scale. 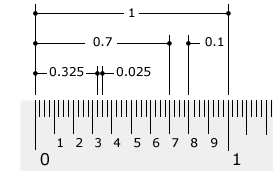 On this simulator, the vernier is the below scale, that slides under the main scale (fixed) that measures the greatness ‘inch’ in your decimal form (this means that the inch (1in) is divided in ten divisions (the spaces between the long marks – 0.1in) that are subdivided by four (the spaces between the short marks), making 40 divisions or 0.025in) -figure 1. The vernier has twenty-five divisions, so it divides the smallest division of the main scale by twenty-five (0.025in / 25 = 0.001in) [ | i i i | i i i | i i i | i i i | i i i | ] – figure 2. If the zero mark of vernier aligns with one of the bigger marks of the main scale will give the tenths of the measure, direct reading! If it aligns with the first short mark, sum 0.025in the the decimal measure; (0.050 if aligns with the second and 0.075 if aligns with the third -multiply the number of marks by 0.025in) sum this result (milesimal part) with the integer part and with the decimal part. The reading is very simple -figure 3. 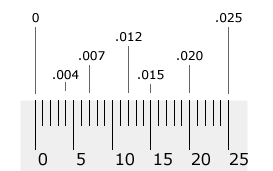 Observe if the zero (0) of vernier coincides with one of the marks of the main scale the reading is direct.